We tossed it with rotini pasta. All ages – 13 on up – declared the dish delectable. 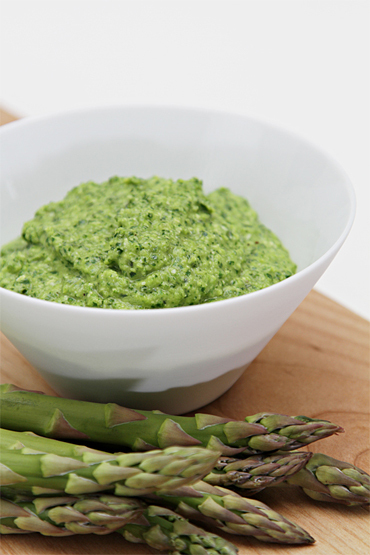 In addition to the asparagus, the pesto combines basil, extra virgin olive oil, Parmesan, and a dash of lemon juice – providing “an exquisitely creamy and savory pesto that tastes like spring!” Viviane Bauquet Farre of food & style, who created the recipe, says. We used our Everyday Fresh oil to prepare the pesto. Our medium-robust Arbosana would be a good choice, too, providing a touch of almond flavor. In fact, any of our oils would be good! The pesto has many uses, in addition to pasta. Viviane recommends you stir it into a risotto; spoon it on top of a pizza; spread it in a sandwich; drizzle it on top of grilled vegetables, chicken or fish; or use it as a dip. “The delicious possibilities are endless,” Viviane notes. We couldn’t agree more.